Featuring 2-gang design in weatherproof aluminum box, Pump Receptacle Kit provides power and on/off switching for outdoor water pumps for pools, spas, and fountains. It is offered with 20 A/120-277 Vac single-pole switch and 20 A/125 V NEMA L5-20 locking receptacle or 20 A/120-277 Vac double-pole switch and 250 V NEMA L6-20 locking receptacle. Mounting hardware, gasket, closure plugs, wire connector, and instructions are included. MILFORD, Conn., Aug. 16, 2005 - Bryant announces a new Pool Pump Receptacle Kit that combines the key pump components of connection and control in a single unit. The compact, 2-gang design of the single-source kit provides both power and convenient on/off switching for outdoor water pumps including pools, spas and fountains. Because the switch and receptacle are contained in one weatherproof aluminum box, the Bryant pump kit not only offers customers of electrical distributors the convenience of one-stop shopping, but also reduces the cost of materials and labor by eliminating the need to install separate components. The Pool Pump Receptacle Kit is available with either a Bryant 20A 120-277V AC single-pole switch and a heavy-duty 20A 125V NEMA L5-20 locking receptacle or a 20A 120-277V AC double-pole switch and heavy-duty 250V NEMA L6-20 locking receptacle. Both versions provide for easy pump control while helping prevent accidental disconnection of the mating pump plug. 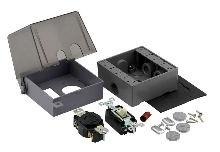 Mounting hardware, gasket, closure plugs, wire connector and tri-lingual assembly instructions are all included with the kit. The kit is NEMA 3R Rated, UL Listed, CSA Certified and meets NEC Articles 680.22 (A)(1) and 406.8 (B)(1). For additional information about the Bryant Pool Pump Receptacle Kit, contact Brian Grayson at 203-882-4836. To request a copy of the new Pool Pump Receptacle Kit brochure (BSS110), call Bryant Customer Service at 800-323-2792; or visit: www.bryant-electric.com.